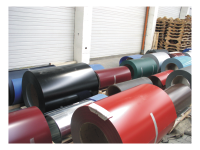 The main material used in the manufacturing process is the steel sheet coil with multi-layer protection and 1250 mm standard width, in different thickness, colors and coatings, delivered from the most important producers of steel semi-fabricates in Europe. 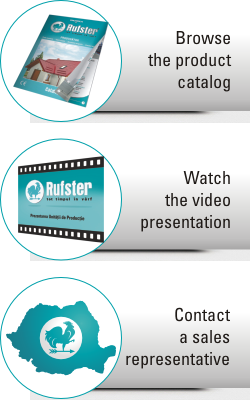 The RUFSTER products are made form hot-dip zinc-coated steel sheet covered on both sides with multi-layer system that protects the base material from corrosion. 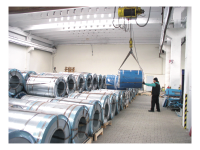 The RUFSTER production unit is equipped with two slide cranes, each with 5 Ton lift capacity, that are used for unloading, depositing and mounting the steel coils into the production lines. 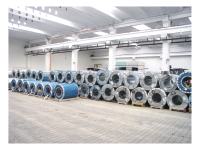 According to standards, the main material stocks are deposited in covered space, inside the main production hall, kept in optimal working conditions. 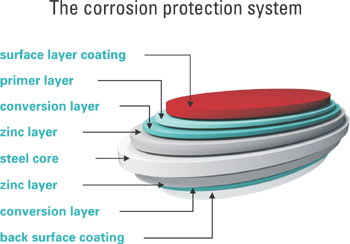 Supply is made based on the necessary of standard colors, especially the ones with high request for which we keep large stock and the demand from clients or distributors for colors not included in the standard range.